Athletes around the world are looking for ways to increase their speed, power, and explosiveness. The video above shows a leg workout you can do with Myosource Kinetic Bands to increase your speed. Notice that most legsworkouts involve the hip flexor muscles. This muscle group is essential for speed and quickness. It is important to work hard in order to increase your speed. Step Ups: Use a weight bench or other stable item for this exercise. Start with the right foot and step up onto your item of choice driving the left knee up. Each time you step up drive upward with each knee and on the way down drive your legs back. Switch and step with the left foot. Perform 8-10 on each side. Squat Jumps: From the standing athletic position squat down and explode up driving your knees up to fully work the core muscles. You can also add a twist to increase the resistance and the intensity of this drill. Jumping Lunges: Lunge, jump, and switch your footing. Focus on driving the back knee down, keeping the front knees behind the toes, and bringing the opposite leg elbow upward. Make sure to keep your back is straight throughout the entire drill. Burpees: From a standing position drop down into a squat position placing hands on the ground. In one quick motion extend both feet back into a front plank. 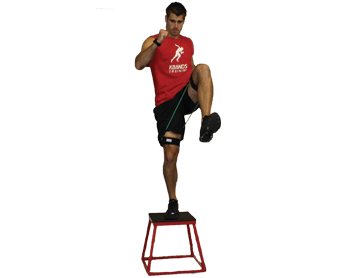 Then return to the squat position, jump up into a squat jump back to starting position. Mountain Climbers: Drive knees up from the push up position into a running like motion and focus on getting your knees up above your waist. Push to increase speed. Spider Man: This is the same basic exercise as Mountain Climbers but the legs move laterally and can also be performed moving from side to side gaining ground. 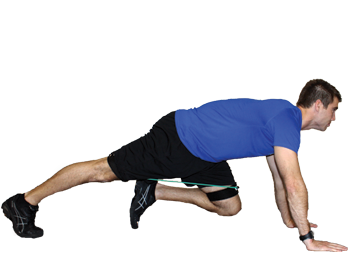 Bear Crawl: This exercise is basically running forward or backward on all fours. As the right hand comes forward the left foot comes forward. This is an opposite hand and foot combination in running motion. Finish Up Working the Core: The video shows a variety of exercises to build the core muscles including leg lifts, leg straddles, sit-ups, knee raises and more. It's not the will to win that matters,everyone has that.